Fort Jefferson is located on Garden Key. It was built in the mid 1800s with over 16 million bricks. It was originally built to protect the Gulf of Mexico shipping lanes where ships traveled from the Mississippi River to the Atlantic Ocean around the Florida peninsula. The fort's location is perfectly situated at the edge of the loop current part of the Gulf Stream that curves up into the upper Gulf of Mexico. This current made for a natural navigation for sailing ships. Many ships would pass within a cannon's range however the fort never fired a shot during its history. The lighthouse at Garden Key was constructed in 1825 and still operates today. While construction of Fort Jefferson began in 1846, the fort was never completed. When the rifle cannon was invented the eight foot thick walls were no longer impregnable. Thus, the fort was rendered obsolete before completion. Construction went on for 30 years to complete the outpost. It remains the largest masonry structure in the Western Hemisphere. Fort Jefferson was used as a military prison during the Civil War. During that time, it was home to Dr. Samuel Mudd, who was convicted of treating John Wilkes Booth after President Lincoln's assassination. The fort occupies 11 of the 16 acres on Garden Key and is an engineering wonder but its usefulness in the late 19 th century was in serious question. After several Yellow Fever epidemics the Army abandoned the fort in 1874. In 1908 the area became a wildlife refuge for nesting birds and a marine sanctuary. 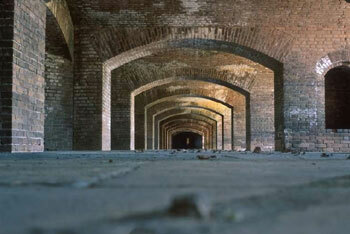 In 1935 President Roosevelt proclaimed Fort Jefferson a national monument and in 1992 the area became a National Park. There is a self-guided tour of the fort that takes about 45 minutes. John Audubon visited the Dry Tortugas in 1832. He observed the Noddy and Sooty terns that nest here. Over 100,000 of them return to the same site year after year and it is the only place in the U.S. that the birds roost. Over 200 varieties of birds can be observed on these islands. The best time for bird watching is March – September with the migratory birds peak season in April and May. Dry Tortugas National Park has some of the best snorkeling in North America. With numerous shallow water wrecks and reefs it is great for beginners or the experts. 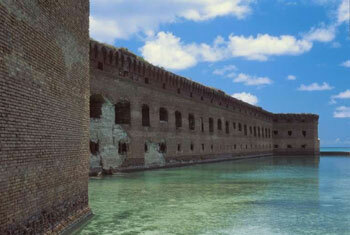 Great snorkeling areas are just off of the moat wall surrounding Fort Jefferson. The shallow water provides snorkelers with much to see. Colorful corals, a great variety of tropical fish and shells. The harbor is also home to giant Goliath Grouper and numerous Tarpon. Click on any Captain below to visit his page. All former Captains of Andy Griffiths Charters are independent owner/operators. Please contact them directly by clicking on their image below. Capt. Andy grew up in the Keys as the son of a commercial fisherman. He has plotted over 2000 "spots" while fishing over the years. He still captains his own boat, The Stephanie. As the economic times grew tougher Captain Andy decided that owners could still make money if they ran their own boats and took care of them themselves. All former captains of Andy Griffiths Charters are independent owner/operators.